Multiplying onions and other perennial strains are typically hardy to -26F (-15C) when given a protective winter mulch. Mix a balanced organic fertilizer into the soil before planting a new bed. Potatoes, Lettuce, Beet, Thyme and Chives. Often grouped with garlic and shallots. Start with purchased bulblets or corms, set out 10 to 6 weeks before your first fall frost, or in early fall. Harvest bulblets from topsetting onions and use them as pearl onions in the kitchen. When plants die back, cured roots often yield a small shallot. 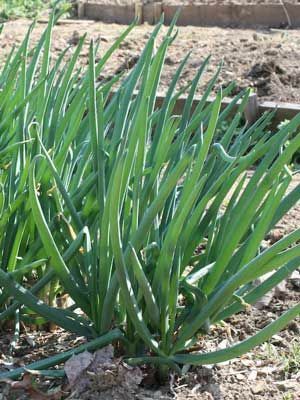 In spring or fall, you can cut off small divisions for use as scallions (green onions). In fall, move perennial onions to a fresh location to avoid problems with onion root maggots, which are attracted by decomposing onion tissues.